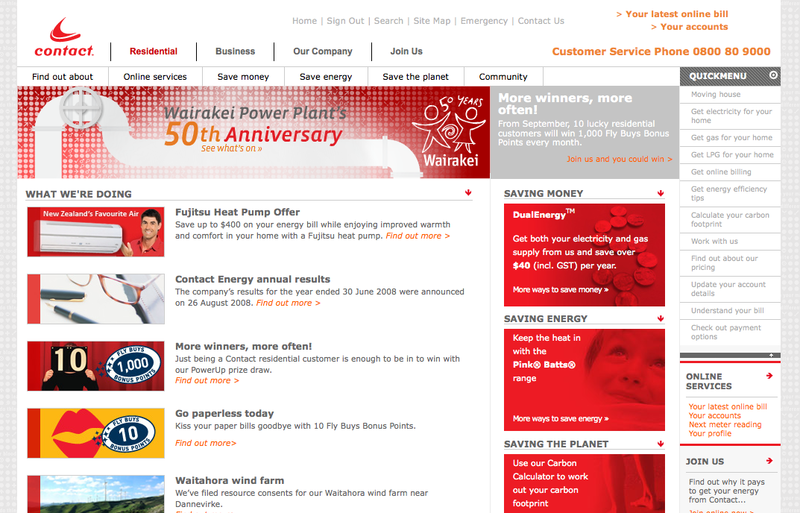 I was quick to complain about Contact Energy when I found their online billing frustrating. I don’t have to visit the website because the email contains all of the information I’m most likely interested in – the amount I owe and the date that the payment is due. As long as that looks right, I’ll delete the email and move on. If not, the most prominent link takes me straight to the online bill, rather than dumping me in a maze of a marketing site. The email is also signed by a real person, which is nice. They could use fewer words – i.e. the first sentence only needs to say “Your latest online bill has arrived”. 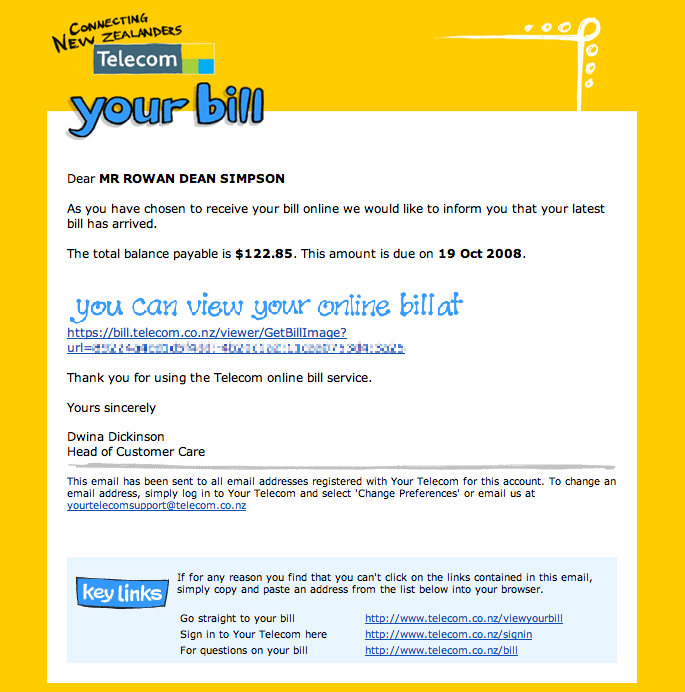 The URL for the link to the bill could be more human-readable – interestingly the link they provide direct to the bill at the bottom of the message is much nicer, so why not use that I wonder? They could include the standard text that appears on the bill to explain that a direct debit is setup for this payment. But, those are all small things. This is a much nicer user experience. Full credit! And, what’s really interesting about this … I’m now much more likely to be receptive to appropriate marketing messages that might be included in the future in this sort of email, or on the associated web site. Earlier this week I found myself in the Koru lounge at Wellington airport waiting for a delayed flight. The “Your organisation…” is a bit misleading. I was just using the free wifi point. If anybody from Air NZ is reading … what? I realise it’s been a few years since I worked in a big corporate, so I might just be unaccustomed to being treated like a little kid by an IT department, but seriously what are you trying to prohibit here. 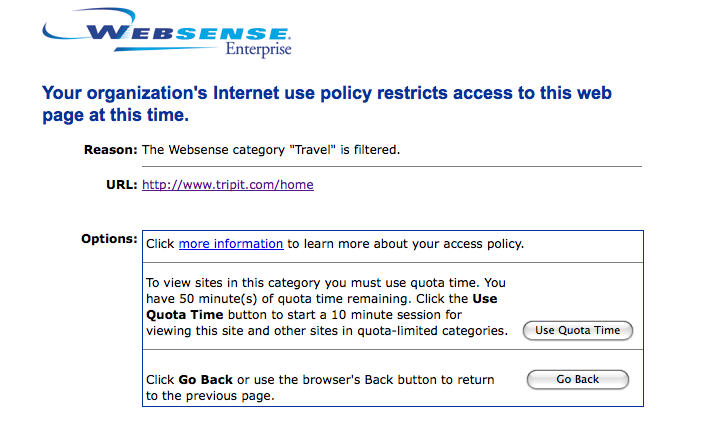 You don’t want me to visit travel related websites while I’m in the Koru lounge? What’s worse, you actually allow me to do it, but you want to make me feel naughty in the process? As it was I just clicked the “Use Quota” button and it let me straight through. What other sites you don’t think are acceptable, I wonder? The item in the inbox has 9 attachments, but the message itself has only 6. The 3 that are missing are the PDFs with the booking details. When I forward to TripIt it is no longer able to automatically add the booking as it has in the past. When I look at the same message through gmail.com it has all 9 attachments and works fine when I forward to TripIt, so it would seem to be a Mail.app problem. Is this just me, or have others seen this too? Kim from AirNZ added this comment. Good news! I’ve signed up to receive our power bill via email. So, I get an email telling me our latest bill is now available online. Here is the page I’m redirected to. It’s a landing page full of noise. See how long it takes you to find the link to the bill. There are actually two links. Neither of them exactly jump out at you. I never even noticed the link in the top-right until I took this screen shot. This is not especially surprising as this position is so often used for advertising that people will just block it out. It’s reasonable to assume that the link would be somewhere in the body of the page, but as you scan that area everything which looks vaguely like a link says “Find out more >”. More about what, exactly? Why don’t they link directly to the bill, I wonder? Or even better simply include the important information (e.g. total amount owed and due date?) in the email itself and let me avoid this hassle altogether. Is online billing about making things easier for customers or creating opportunities for the marketing department?